Who would think that an almost-600-page novel about a maladjusted mathematician could be so compelling that it could make a reader ignore one of spring’s first sunny days? Ethan Canin’s A Doubter’s Almanac is the singular novel that can do just that. Milo Andret, (rhymes with bandit – and yes, I think that’s a clue to a flaw in his character) is a mathematical genius and one of the most annoying men you’ll ever meet between two covers. A Doubter’s Almanac traces Milo’s life and that of his family from his childhood in the woods of northeastern Michigan through his recognition as one of the world’s greatest mathematicians to the torment and obsessions that lead to his fall. The first two hundred pages of the book are a third person narration of Milo’s early life. The reader learns of Milo’s genius, his sexual relationships, his lack of connection with any of his colleagues, and his excessive drinking. The second part of the book is narrated in the first person by Milo’s son Hans thus providing fresh insight into Milo’s wife Helena, their children, and Milo’s self-destruction. Milo is as my husband might say “a piece of work” yet he attracts a cast of engaging characters as if he were a giant magnet and they were mere metal filings. Canin’s skill with words entices the reader in much the same manner. A scene narrated by Milo’s son, Hans, depicting a family picnic near their southern Ohio home illustrates Canin’s ability to mesmerize with word pictures as he presents insight into his characters. The state park was where my mother liked to walk. At a certain turn in the trail, which looked down on a stretch of whitewater that foamed and leaped over refrigerator-sized boulders, she would set down our picnic blanket. The spot was only a short distance from the parking lot, but its topography was as wild and wooded as anything you might find in a state a thousand miles to the west. The roiling water, fifteen feet below the path, was thrilling. To me as a boy – although of course I understood the volumetric dynamics of why it had sped up – it was frightening as well: a frothing cauldronic reminder of what our familiar river could become. My mother sometimes shushed us as we ate so that we could listen to the roar. You could discern the whole orchestra in it, from upright bass to triangle. My father peed like a horse. His urine flowed in one great sweeping stream that started suddenly and stopped just as suddenly, a single, winking arc of shimmering clarity that endured for a prodigious interval and then disappeared in an instant, as though the outflow were a solid object, an arch of glittering ice or a thick band of silver – and not (as it actually approximated) a parabolic, dynamically averaged graph of the intersecting functions of gravity, air resistance, and initial velocity on a nonviscous fluid, produced and exhibited by a man who’d just consumed more than a gallon of midwestern beer. . . When it struck the edge of the gravel shoulder, the sound was like a bedsheet being ripped. Beneath this high reverberation, he let out a protracted whistle that culminated in a tuneless gasp, his lips flapping at the close like a trumpeter’s. . . From my vantage point he appeared entirely unashamed. . . .My father moved up close to peer through the windshield, zipping his trousers and smiling through the glass at my mother. . .
‘Thank goodness,’ my mother said when the car door closed again. ‘I was getting a little bored in here.’ In those days, this was her version of malice. Dazzling word pictures aside, A Doubter’s Almanac is at its core, a story, a story that bends and twists its way into the reader as it tells of the burdens of genius and of the narrow precipice that stands between brilliance and insanity. It’s also a story about escape, escape into substance abuse and into the acceptance of a different set of standards for a legendary mind. Additionally, it’s a story about the sins of the father and the ability of one generation to diminish the achievements of the next. The book’s distinctive chapter titles like “Occam’s Razor,” “Another Roof, Another Proof,” “A Topologist’s Apology,” “4656534,” and “Theodicy” and the clues embedded within those chapters help A Doubter’s Almanac soar above the humdrum. Canin’s adroit use of language slows the reader down just enough to force consideration of the reasons behind the characters’ actions while not impeding the swift current of the story. This is a book you want to devour quickly, but Canin places bumper strips along the road that force you to realize that every single word he writes implies something you need to ponder and perhaps even doubt. The novel derives its title from a Descartes quote: “If you would be a real seeker after truth, you must at least once in your life doubt, as far as possible, all things.” Canin places the quote at the end of the book, with a blank page separating it from the novel’s end. It sits there alone on the page where it begs readers to fully consider whether true genius is simply the ability to doubt even one’s greatest accomplishments. 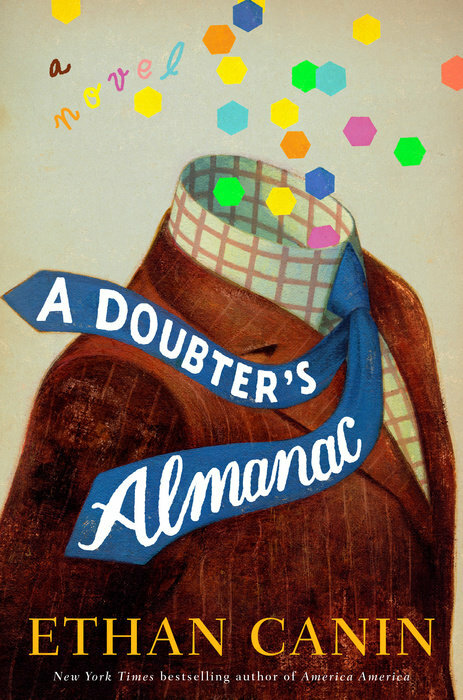 Summing it Up: Read A Doubter’s Almanac to enter the life of a brilliant mathematician and to consider whether genius is a curse or a blessing. Fans of Richard Russo and Jane Smiley will applaud Canin’s acrobatic artistry with words, characters, and ideas. If this algebra-detesting reader could be completely entranced, you'll love it too. The author of Major Pettigrew’s Last Stand returns with another delightful comedy of manners set in England in 1914, the summer before World War I began. The Summer Before the War is set in Rye, a small town in southeastern England, where class differences and romantic intrigue arrive just in time for readers lamenting the ending of Downton Abbey. The novel isn’t as slapstick, laugh-out-loud a tale as Pettigrew was – after all war is at hand and it’s impossible to ignore. Instead, Summer offers Beatrice Nash and a cast of appealing characters who mirror the changes arriving on England’s shore. Beatrice arrives in Rye to teach Latin at the local grammar school where a woman has never taught such a serious subject before. Her champion, the childless Agatha Kent, a 45-year-old pillar of the community, is a strong woman who nevertheless believes women should not step outside their assigned societal roles. She and her husband, a quiet London military officer, have two nephews who greet Agatha when she arrives. Hugh is a surgeon in training and Daniel is a poet hoping to start a literary journal in Paris. When another candidate for Beatrice’s teaching position, a male with strong local ties, threatens Beatrice’s new job, the cash-strapped Beatrice is concerned. She had declined one other teaching offer in favor of Rye. A northern mill town had offered just the productive life, the challenge of public service that she craved, but her heart had failed her at the thought of soot-blackened streets and rows of tenement cottages running across the hills. She had been forced to laugh at her own hypocrisy in choosing seaside Sussex over the surely greater education impact she might make among the children of factory workers. Now she wondered if she would have time to write again and ask them to reconsider her. If not, she might eke out a few weeks at a friend’s home near Brighton, but her chances of finding some other position immediately were not good. She had no romantic notions of becoming a parlor maid or an actress and she had never had patience with those more literary heroines who solve their problems with a knife or an oncoming train. The school’s board was expecting her to speak to them. She would face the Board of Governors with her very best smile and a forthright presentation of her skills and qualifications. She would not let them see that she knew the answer was already decided. They would pick the man over her, but she would make sure they knew in their hearts, that she was the better candidate. Beatrice is able to teach and one of her best students, a boy called Snout, is a winning half-Gypsy boy, a Roma, who stands in for the racial and class prejudices of the times. His service in the war illustrates how class barriers were breached when everyone served side by side in the trenches. Once the war begins, both Hugh and Daniel enlist along with almost all of England’s young men. Simonson carefully navigates the novel into the more thoughtful wartime period while continuing her light touch and wry humor. Summing it Up: Downton Abbey fans will thrill to this Jane Austin-like treatment of 1914 England as war looms. Heroine Beatrice Nash is Elizabeth Bennet on a bicycle carrying her teaching credentials and a determination to earn her own way. Read this thoughtful ode to enter the bright, promising summer before the war where you’ll emerge both entertained and educated. 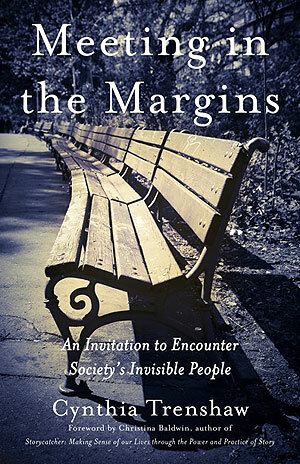 Meeting in the Margins: An Invitation to Encounter Society’s Invisible People is a powerful read. Cynthia Trenshaw, a recently widowed Grand Rapids, MI chaplain and massage therapist, moved to San Francisco to obtain a post-graduate degree in theology. After two years she planned to return to Michigan to become a chaplain for Hospice of Greater Grand Rapids. Instead, she began hanging out with the “untouchable people of the streets,” connecting “skin-to-skin” as she offered herself through massages. Carrying her backpack filled with clean towels, antibacterial gel, and massage lotion, Trenshaw met Gloria. My hands curve around her right ankle to raise her foot; I cup her heel in my left palm and place my right hand over her arch. No need to do anything else, just hold this dark, callused foot of this unknown woman, just hold it, just breathe into the moment. There is nowhere else to be but this place where my skin touches her skin, no time but this time when her feet have brought her to this park and my hands have offered this work. Our shared connection at her foot becomes a bridge across which her stories and mine now begin wordlessly to cross. As my fingers stroke lotion over her foot, her skin hears the silent story of the therapeutic skills I’ve learned for her. As I trace the bones of her misshapen foot, my thumbs listen to her mute memoir. Her feet are dirty, her toes deformed; fungus grows under her nails. Chunks of dirt and slough fall from wherever I touch. It does not matter because beneath my fingers I can feel a softening in her tired and neglected feet. Seeing things you’ve always known to be true – yet still avoided -- and reading them in new ways through the stories of marginalized people makes Meeting in the Margins a powerful and dangerous book. Trenshaw’s ability to enter the lives of those we rarely see is enough; it’s just enough to change even the most jaded reader. Summing it Up: Cynthia Trenshaw’s stories of the lives of people living on the margins will change you. It will bring you almost within touching distance of the lives of the invisible people living in the margins and it will make you realize that you need to bridge the gap – for your own well-being. Read this book! Note: Tomorrow is Maundy or Holy Thursday, the day western Christians “do this in remembrance of me.” If there ever were a day to think about foot-washing and people on the margins, that day and this week when we also watched another attack in Europe by people on the margins, is it. Reading Group Guide: The last section of the book shares the “verbal portraits” of seven people living in the margins. After each story, Trenshaw offers questions that would make for excellent discussion in a book club or study group.